Map of Han/Three Kingdoms China? Re: Map of Han/Three Kingdoms China? lewinernst wrote: Very good to know, thanks a lot . Do any of you know of "plain" maps of the time, meaning they contain geographical features and cities/counties, but no borders or coloration? What software and which raw data do people here use to make these maps (I assume it's not just Illustrator)? EDIT: Is it possible that the rivers in China (particularly Yellow and Yangtze) run very differently nowadays? The maps were done on a base of QGIS, and then edited through Paint.NET. The maps that you quoted were quickly put together by me in Paint.NET. Our atlas was supposed to have the rivers according to the Chinese Atlas maps of the time periods, but if I'm not mistaken, besides the major rivers and a few minor rivers, Fornadan never got around to correcting their courses to the historical ones. 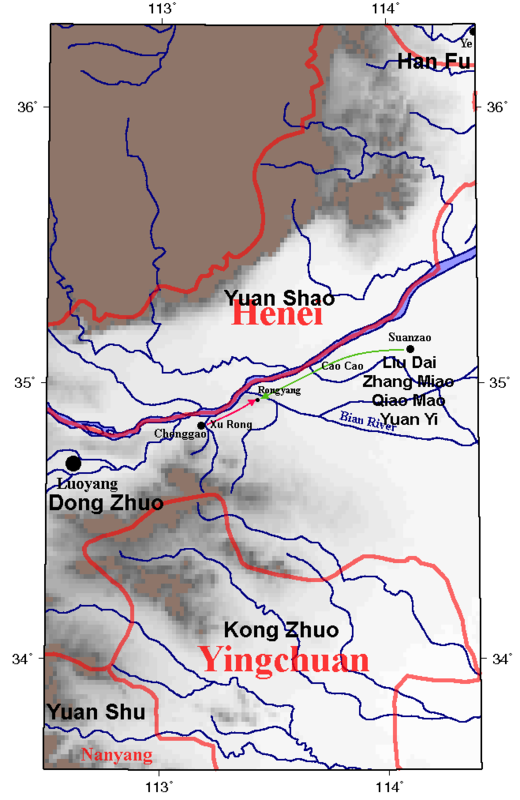 The commandery borders and the settlement names were based on the Historical Atlas of China. lewinernst wrote: How close to the historically accurate division of power are these maps (specifically the one of 210)? Fornadan mentioned most of the imprecisions of the map (the main major one is Bing province belonging to Yuan Shao/Cao Cao). Besides that one, of the 210 map, it's also possible that Zhang Lu's control didn't extend to the whole of the Hanzhong commandery, namely to Shangyong and the lower Han/Mian river basin. Jolt wrote: 2 days later, 5 provinces done down. EDIT: And as a sneak peek, here you have Cao Cao's favourite commandery and (Presumably the one) where he got his Ducal/Princely title from! Firstly, the reason I am suddenly so interested is that we are simulating the period starting in 208 with about 30 people over 4 days and are trying to be accurate as possible in visualising what happens, so thanks for everybody's patience. Do you still have a version of this map that you could share? (maybe the much bigger image that used to be at http://www.history-in-maps.com/map.html ? (I can't seem to get it to run in any browser, the JS throws errors). I'm trying to get a handle on something. Xuanmen Pass (which I believe is often called Hulao or Sishui) was the pass that guarded Luoyang from the east. As near as I can tell, the coalition forces at Suanzao weren't concerned about this, so I'm under the impression it wasn't along their line of advance. But I can't seem to find a good map that actually has Xuanmen Pass on it. Was it just that the Suanzao group never got that far (because Cao Cao was defeated in Rongyang and the others never tried a second advance) or was it not actually in their way? Or am I just totally confused about the geography? This map is titled "Fortified Passes to Luoyang in 184"
From Gongjin's Campaign memorials, here's a map of the eight passes (in wade-giles; clockwise-ish from "Hsuanmen" the gates are Xuanmen, Huanyuan, Taigu, Guangcheng, Yique, Hangu, Xiaoping, and Meng [Mengjin?]). According to Fornadan's useful Xian's Voyage from Changan to Luoyang, Suanzao is at the east edge of the map (just next the giant 35 offmap); Xuanman pass would be about where Chengyi is (roughly a third of the way from Luoyang to Yanzhou). So, given that Administrator Wang Kuang of Henei was in the coalition, they could have just crossed to the north, bypassed Xuanmen, and invaded via Xiaoping or Meng. Alternately, since Inspector Kong Zhou of Yuzhou and Administrator Yuan Shu of Nanyang were also in the coalition, they could have invaded from the south or the southeast. Really, if they invaded, Xuanmen's defenses would probably wind up like the Maginot line 1750 years later -- sturdy, but bypassable! Looking closer at the second map (thanks for sharing) I see Xuanmen is actually on there (labeled Xuanmengguan) south of Chengyi. I'm more interested in charting Cao Cao's actual invasion route than I am in hypotheticals. The SGZ describes him as heading straight for Chenggao (Chengyi) from Suanzao. He never made it that far because Xu Rong ambushed him in Rongyang and defeated him. 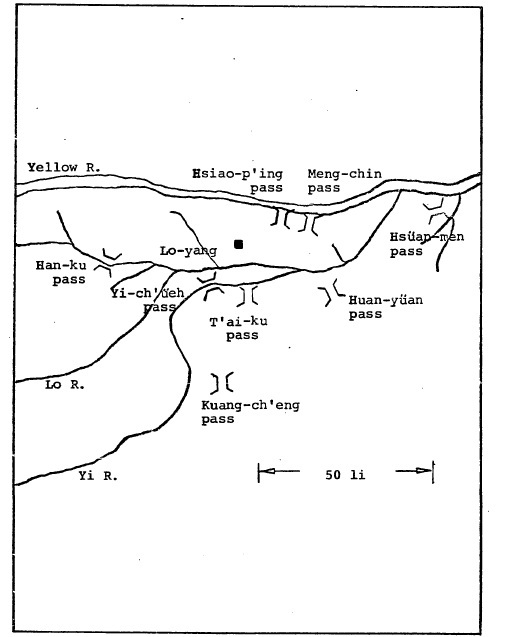 This map doesn't make the geography entirely clear, but it seems like that by following the Yellow River upstream to Chenggao, Cao Cao could bypass Xuanmen (and the mountains it guarded) entirely. His plans reference Chenggao several times but he never mentions Xuanmen. Hmm... wikipedia says the battle took part at what's now Xingyang; it's halfway between Luoyang and Yanjin (modern Suanzao), so it'd very likely be Yangying on the map, east of Chengyi. Huanyuan gate, and, therefore, would be bypassed. I realize that you said the battle was at Rongyang, not Xingyang, but I don't see Rongyang on the map. Xingyang was in Rongyang county. It was near Yangying on the map. Cao Cao was aiming for Ao grainy (Aoting on the map) and was ambushed while crossing the Bian river. So it looks like Cao Cao was following along the Yellow River. Chenggao was probably a softer target than either of the fortified mountain passes at Xuanmen or Huanyuan. Ah, so Rongyang was a county; that explains why it wasn't on the map.